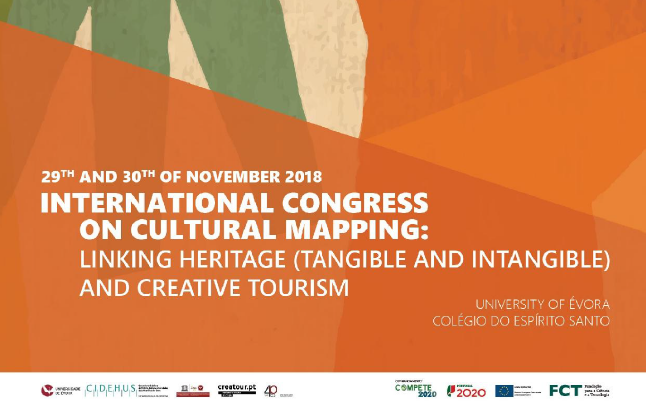 The "International Congress on Cultural Mapping: Linking Heritage (Tangible and Intangible) and Creative Tourism" will be held in November 29-30 in Évora, Portugal. Structured in two days, the congress aims to provide a better understanding of how cultural mapping can propose actions that enhance the awareness of cultural identities, debate its implications for local development, community engagement and policymaking, including sustainable and creative tourism, and foster debate over its long-term results. The congress is organized by CREATOUR Alentejo team (CIDEHUS, University of Évora) and the UNESCO Chair "Intangible Heritage and Traditional Know-How: Linking Heritage", in collaboration with the Centre for Social Studies (University of Coimbra). Registration deadline: 15 October 2018.